As EDSBS points out, the detestable Mike Leach has a real issue with telling the truth, and the people (i.e. other highly paid coaches) are finally speaking out to put this outrage to an end. It's been an incredible week for the head dread pirate of Lubbock, beginning with his reaction to the rumor, supposedly floated by the Cleveland Browns' Eric Mangini, that Michael Crabtree is a "diva." "Michael Crabtree has been more successful as a receiver than that guy has a coach at this point," Leach said. " ... Part of the reason is he's (Crabtree) too shy to be like that." Said Leach: "My definition of a diva is someone who's loud and self-absorbed. Michael Crabtree is the furthest thing from loud that I've seen." [...]Leach described Crabtree as the "ultimate team player who would serve the 49ers well." As for Mangini? "Let's see how all those non-divas do up in Cleveland this year," Leach said. "I'm happy for Stephen McGee," Texas Tech coach Mike Leach said. "The Dallas Cowboys like him more than his coaches at A&M did." "I don't understand Coach Leach's comments about Stephen McGee," Sherman said Monday. "He was named our starter until he got injured. I've always believed in Stephen's character and I've always believed in his talent, and I always will. I see him having an outstanding NFL career. "Coach Leach is in no position to comment about my relationship with Stephen McGee." In the end, a perturbed Sherman addressed the issue two straight days. Leach, unable to not have the last word, fired back again. "I never questioned the handling of the (A&M) players in any way and have always expressed the utmost respect for their coaching staff," Leach told The Avalanche-Journal. "I’ve always said that it is truly exciting to play Texas A&M - the quality of coaches they have, the great team and great tradition and, above all, the quality of players they have," Leach continued. "I’ve always known A&M had great players. The fact that they have the luxury to put a third- or fourth-round draft pick on the bench, to me, identifies what a truly great team they are. "It’s an honor for us at Texas Tech to have the opportunity to play them. There are numerous players on our team that will never get a look or play a down in the NFL, so you can imagine how exciting it is for me and them to go play a team the magnitude of Texas A&M and look over there on the bench and see third- and fourth-round draft picks." "How can anyone not be shocked that they’re offended by this?" Leach told The A-J. "How is that possible? I mean, they’re the ones that keep issuing these official statements. I haven’t issued any official statement. I just answer questions when somebody asks me one." Ah, great stuff. Sherman, of course, can't stay quiet either, so he has chimed in yet again as well. Responded Sherman on Tuesday, "I'm not one to say that's just Mike being Mike. You're not going to get a free pass with me. I don't get a free pass. I would never comment about any of his guys." McGee won the starting job last preseason, but was injured in the second game and never fully recovered. . . .
"That could have been taken as a shot at Stephen McGee that if he was so good then why didn't he play?" Sherman said. 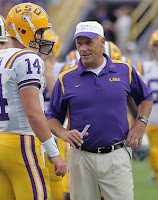 "Or it could have been taking a shot at the Cowboys, or at (former A&M coach) Dennis Franchione. "Coach Franchione's job wasn't to try and make Stephen an NFL quarterback, it was to win football games. And if it was his feeling that running the football was his best choice, like it was when I was here (as an assistant) with R.C. (Slocum), then that's what he did." I don't know much about Stephen McGee. I didn't see anything of him last year, though I saw him play a few times in Franchione's gun-option attack that never got off the ground. As far as NFL drafting quarterbacks, I don't have the data but it's hard to evaluate. Guys with talent who are late draft picks or undrafted have to get lucky to see the field, so there is a skew to high draft picks, and the NFL is big on measurables. Matt Stafford was projected as the #1 overall coming out of high school, and sure enough in college he neither got shorter nor threw the ball with less velocity, so he was there again. Leach is right that the NFL overvalues arm strength, and he is right that it is not nearly so scientific as all these NFL guys pretend. That said, where you get drafted is a pretty good predictor of what kind of career you will have -- on aggregate -- but there's a ton of noise, especially among quarterbacks. But, if nothing else, we should all just be thankful we have Coach Leach to keep us entertained in the offseason. Maybe his next quarterback, Taylor Potts will get drafted: he's 6'5", 220 lbs. P.S. I'll be out of pocket for the next few days at the Kentucky Derby. Betting suggestions welcome. Heard an anecdote relayed from Oklahoma State's offensive coordinator (good coach, entertaining speaker). He was talking about the four verticals concept, which I and Dan Gonzalez recently explored in depth. As Dan explained, the key to this whole concept is the "seam-reader" -- the slot receiver who reads the deep coverage and can run a post, seam, or square-in. And as I explained, even if you don't give that player a full panoply of options, at minimum you tell one slot guy to read middle of the field open (two deep safeties) or closed (one deep): against middle of the field open the guy splits the safeties to streak down the middle void; against middle of the field closed the receiver stays up the hash to put the free safety in a bind between the two slot players. In Okie State's terminology, they call this player the "beater." One thing Dan and I didn't talk much about was how do you decide which guy you want to be the "beater" or "divide route" -- the "get open" guy. So how do you choose who you want running it? Typically, as Dan draws it up, he likes his best receiver to line up in the slot and to drill that down. You also can do it just to the field: if the ball is on one hashmark you can have the receiver to the wide side run it because he has more freedom. Brewer addressed this question, and talked about that for him it is often a matter of personnel. Specifically, if you get in three-wide gun (as Okie State often is), the defense often subs in a nickel defensive back for a linebacker. But the problem there is that the defensive back is better than the linebacker: he doesn't go for all the fakes and moves that the seam-reader or "beater" player uses to get open. To illustrate what they did he told an interesting anecdote. Brewer used to be an assistant and offensive coordinator at Marshall back in the Bob Pruett days, where he coached Chad Pennington (and some guy named Randy Moss). They decided to run the "beater" to the side where the linebacker was and away from the nickel back. But the problem was that the other teams would often shift this. Fortunately, Pennington was a pretty bright guy, so they let him determine who was going to be the beater pre-snap. And how did they communicate it? Pennington would get to the line, turn to the side where the linebacker was and not the nickel defender (and hence the also the slot he wanted to run the "beater"), and would just clap in that general direction. Everyone knew what it meant, and off they went. The poll for best offensive staff turned into a two-man race between Mike Leach and Urban Meyer, but Meyer ran away with it with 28% of the vote to Leach's 17%. A distant third was Oklahoma with Stoops and Wilson at 8%, along with "other" at 8% as well. Not a total surprise, but I have to wonder how the poll would have been if I'd constructed it better: I left off Georgia Tech's Paul Johnson. Feel free to comment on the votes. It begins: Pat White to Dolphins -- "A wildcat that can throw"
Pat White was selected by the Dolphins, and, at the risk of getting overexcited, there might be real ramifications to this. As Jon Gruden just said, and I do my best to recollect his words from memory: "I've been studying the spread offense all last season, and it gives you a player advantage. Defenses were dropping extra guys into the box for the wildcat -- well here's a wildcat that can throw." Implicit in what Gruden said is that what the Dolphins can do is go beyond to wildcat to simply the spread itself: the quarterback as dual threat, which puts the defense -- and specifically the safeties -- in an incredible bind. I have much discussed these ideas previously. Keep in mind too that Gruden knows what he's talking about on this point: he just returned from the University of Florida clinic where he lectured and talked with and learned from Bill Belichick and Urban Meyer -- and Meyer's offense was a particularly important subject, particularly the bind that a true dual threat quarterback provides. Now, I'm not predicting White as rookie of the year, or that he will displace Chad Pennington, but this is an important pick because he goes to a team that knows what they are doing with this stuff. David Lee and Dan Henning obviously brought in the Wildcat series last season -- which relies on the same spread offense principles seen throughout college -- but did so without a true passing threat except as a gimmick. White should play about a series or two a game, and it will be fascinating to see how it plays out. (Note too it also eliminates all the injury fears common to going full-spread-to-run in the pros: if White got hurt they still have their starting quarterback.) Video below on the wildcat. Now add the passing element. 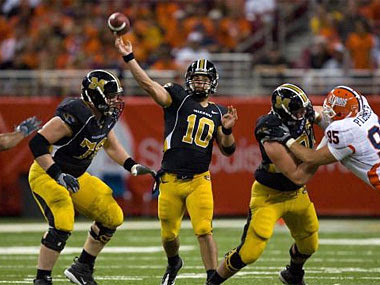 [W]ith a pile of passing yards and a bucket of collegiate touchdowns in tow, Missouri quarterback Chase Daniel believes the wide-open, receivers-all-over-the-field offense now dominating leagues like the Big 12 would work just fine in the NFL. "I've been telling some coaches I think that's the way the game's going,'' Daniel said. " ... And that I'm already there." Trouble is not many folks calling the shots in the NFL are ready to agree because "there" is deep in the backfield, lined up in the shotgun, several yards behind the center, taking the snap and slinging the ball around. Not once in a while. Not in just certain situations. No, all the time, every time and Daniel has done it in the same type of offense since he was in eighth grade. . . .
"They find a little trouble in our league," said Washington Redskins coach Jim Zorn, a former quarterback. "They find, I think, they've got a portion of their game down and they're pretty good at it, very talented at it. They know how to get the ball out quick, they know how to avoid, they learn how to make decisions with the ball, pulling it back, and make lots of plays. "But they also find the whole game is not played that way at this level. It's just not, maybe once a year and there's the rub." . . . .
"The biggest challenge for guys who have spent pretty much their whole college careers — and even nowadays, their whole high school careers — lined up in the shotgun and now they've got to learn to get up underneath center, they've got to learn to take a snap, learn to take a full drop,'' said Air Force head coach Troy Calhoun, a former NFL quarterbacks coach. "I think that's, fundamentally, one of those simple skills that just got skipped over to go play college football. It's that timing, timing with receivers, timing in offenses built around getting the ball to a certain spot in a given amount of time that is the biggest issue. NFL quarterbacks are asked to do that in a traditional behind-center posture where they take the snap, drop back three, five or seven steps, survey the defense and deliver the ball. In the shotgun, quarterbacks stand deep in the backfield, often taking the snap and simply throwing from that spot. And it's the pocket passers, like Georgia's Matthew Stafford and USC's Mark Sanchez who are at the top of most teams quarterback ratings in this year's draft. "If he's never played under center and never taken snaps, that's different ... it's a different skill to do all the things you do from the gun from under center,'' said Broncos coach Josh McDaniels, who coached the Patriots quarterbacks and was the team's offensive coordinator before taking the Broncos job. "Your footwork in the running game is awkward, your takeaway from center, your drops are shorter than you're used to. Now the line is right in your face, or that's your perception because you've played back for so long, now your reads are cloudier. Instead of looking downfield, you're looking at the guys right in front of you." There's a lot going on here so far, but obviously Mike Leach disagrees with this. Leach is exaggerating, but it does seem to blink reality that you can dismiss a guy based on dropbacks. Especially considering that the consensus among most is that, with a few exceptions like Peyton Manning and Tom Brady, quarterback footwork in the NFL is pretty bad. Then again, if Orton said it, I tend to believe him since he has had to do it. "But you want to see how a guy gets back there and how he makes the throws he needs to make," Kubiak said. "If he's got a good enough arm and is a good enough athlete to make the changes he has to with his feet, then he's got a chance. It may take more time and a lot of work, and maybe he doesn't play as quickly as people expect, but that's why they call us coach, to figure out a way to get them to do it. If he has the tools, if he can do it, we have to figure out a way to get it done." "I've been telling some coaches I think that's the way the game's going," Daniel said. Is Daniel right? Or are these pro guys right? The best you get is Jim Zorn saying, "But they also find the whole game is not played that way at this level. It's just not." "It's just not," of course, is not an argument (it's just not). But let's assume that he is right that the all-spread (and this article is about the pass-first spread, not just the spread-to-run) is inappropriate for the pros: why? Is it the speed? The specialization of talent? One of the complaints about spread QBs is their lack of footwork, and one of the reasons for that -- which is also a reason that college and high schools go to it -- is that there is simply less footwork in the gun. That isn't necessarily a bad thing: maybe it'd be good for pro offenses? (Think about pick-up football: nobody lines up and takes a seven-step drop in their back yard.) So that's ambiguous. And then is there just so much more benefit by being extra multiple? In college practice time is quite limited, often more than high school. So that could be a factor too. Or, maybe, the pro guys are just whiffing, just missing the boat. I don't have an answer. I end with this: I just watched a special about Joe Montana, who at Notre Dame had been running the triple-option; Bill Walsh, who knows a thing or two about coaching quarterbacks, wasn't scared away. 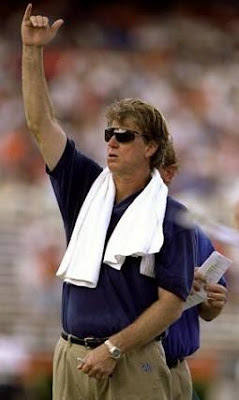 I have a soft spot for Hal Mumme. He was the most interesting thing to happen to Kentucky football since Bear Bryant (and maybe the entire SEC, sans Spurrier); he invented the vaunted Airraid offense which it seems like half of all high school teams now run; and he is always willing to share information about his offense, even back before Tony Franklin had his "system" or Mike Leach became the dread pirate of Lubbock, Texas. And, Mumme's sweaty, exasperated sideline performances will likely never be equaled. Well he's back: Mumme, who was recently diagnosed with prostate cancer, has taken the job as head coach of small McMurry college in Abilene, Texas. New Mexico State fired Mumme after his team went 3-9 in 2008. Commentators like to talk about the "NFL coaching trees" of guys like Bill Walsh and Bill Belichick. Yet among active coaches -- excluding guys like Hayden Fry and Bear Bryant -- I can't think of a better college coaching tree than Hal Mumme's. Not all have been successful, but it's pretty remarkable considering Mumme's (relatively) diminutive stature in the pantheon of college coaches. Among the major coaches who have coached under Mumme -- and all of these guys were under him, running Hal's offense doing Hal's drills and using Hal's techniques -- are Mike Leach (Texas Tech), Chris Hatcher (Georgia Southern and won a D-II National Championship at Valdosta St), Sonny Dykes (offensive coordinator for U. of Arizona), Guy Morriss (Baylor and Kentucky head coaches, now head coach of Texas A&M-Commerce), Dennis Roland (head coach Southeastern Louisiana), Tim Keane (Memphis secondary coach), and Darrell Patterson (linebackers coach at Stanford). Obviously the guy that sticks out in this list is Leach. For roughly a decade after a brash high school coach named Hal Mumme became the head coach of Iowa Wesleyan college in 1989 and hired Leach, a guy whose previous coaching job had been in Finland, the now-head Red Raider played second-fiddle to Hal. As the storyline goes now -- usually in the context of discussing Leach -- the two are credited with dreaming up the potent Airraid offense (named that as part of a marketing campaign by a staffer at the University of Kentucky). Yet, until he broke out on his own, Leach was not well-known, nor was he so credited by the media. Indeed, as the storyline went then, it was Mumme who called the plays, and it was "Mummeball" that his teams had varying degrees of success with at Iowa Wesleyan, Valdosta, and Kentucky. And then they split. Leach took the job as offensive coordinator job at Oklahoma under Bob Stoops. (And how different might history have been: a season earlier Leach had considered becoming head coach of a very small D-II college himself.) It's almost bizarre how different life has been for the two men. Leach's story has been well-documented. He's not quite Bear Bryant (or Urban Meyer or Bob Stoops for that matter), but his trajectory has almost entirely been upward: a quick turnaround of Oklahoma and particularly Oklahoma's offense, and OU wins a title the next year running "his" offense (which isn't entirely fair either way, as Stoops really wanted to hire "Mumme's offense" and the next season, without Leach, Mark Mangino had some input as well); and Texas Tech's unprecedented streak of bowl games, high rankings, and upset victories over Oklahoma, Texas, and Texas A&M in the past several seasons. Then there's Mumme. He lasted only two more years at Kentucky. In the first, UK surprisingly went 6-5 without Tim Couch and went to a then record two-straight bowl games. But in the second, it must simply be known as the beginning of the end. After the 1999 season, Chris Hatcher left to take over at Valdosta State, and Tony Franklin was promoted to offensive coordinator, though at Kentucky everyone knew that Mumme really held the title. Then things got weird. Mumme benched productive but uninspiring returning starter Dusty Bonner in favor of the infamous hefty-lefty, Jared Lorenzen, then but a wee true freshman. (Around this time I heard Terry Bowden good-naturedly tell a room of coaches, as a jump-off from some anecdote I don't remember: "And then there's Hal Mumme, who doesn't hesitate to bench to bench the SEC leader in passing and pass efficiency!") In Lorenzen, Mumme got what he apparently wanted -- arm strength -- but he also got a bevy of interceptions and erratic play, waffling between a 500 yard game against Georgia to disastrous interceptions against South Carolina, and the team wound up a pitiful 2-9. Yet that doesn't even tell the whole story of how bad 2000 was. It was so bad, by midseason Mumme no longer spoke to his offensive coordinator Tony Franklin (though history now tells us that Franklin is himself a prickly guy). And then came the NCAA: apparently an enormous behemoth known as Claude Bassett, Kentucky's recruiting coordinator, had flatly been paying players. (I once rode in Bassett's golf cart: I rode by grasping onto the roof and rail because there was little room in the passenger's seat for . . . obvious reasons, and the entire time I was convinced the cart was going to tip over.) Mumme was never formally implicated, but if nothing else he had little control over Bassett's clandestine activities. And, between the 2-9 finish and the infractions, Mumme's time at Kentucky was done. All was quiet until Mumme took over at Southeastern Louisiana in D-1AA, and resuscitated a dead football program (literally, the program had been terminated) before leaping to New Mexico State, where things never congealed. In his first year he went 0-12, and never won more than four games. He takes the job at McMurry, in Abilene, Texas, presumably because there were few other options. Who can explain how Mike Leach, his friend and former assistant, can go on to such heights while Mumme seems to face nothing but personal and professional tragedy? Chris Hatcher too, who had both played for Mumme and coached with him, has an exceptionally bright future. And who knows if Mumme will have any success at this small school, and even if he does, most won't remember him for that. Mumme, whose wife is a cancer survivor, will also have to wage his own cancer battle. In the last decade, likely Mumme's entire career in D-1 football, his high water mark was a 7-5 season with Tim Couch as his quarterback -- hardly the stuff of legend. 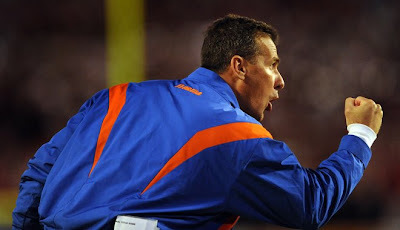 During his time he became notorious for goofy calls, an obsession with how many passing yards his team had (sometimes at the expense of winning), and a tenure forever tainted with recruiting violations, either with knowledge or simple lack of control. For these reasons, to many, if Mumme is a tragic figure, then he's somewhere between MacBeth and Dr. Faustus, as figures who got what was coming to them. But that offense. That elegant, "backyard"-yet-disciplined approach to throwing the damn football. Many of Mumme's hallmarks -- throwing the ball repeatedly with a grand total of about ten passing plays practiced endlessly, warm up drills instead of stretching, relentless passes against "air" with five quarterbacks dropping back on every play, and an unyielding belief in "throwing the ball short to people who can score" -- can be seen not only in places like Texs Tech and the University of Arizona, but in countless high schools across the country. (I really cannot overstate this.) Tony Franklin, Mumme's St. Paul, proselytized the word of the pass-first, shotgun spread offense, and while Mumme may not be divine, he is not without messianic qualities: the rise of the spread and passing offense in the last decade, particularly in the lower levels of football, may have been inevitable, but Mumme's little system, mesh, shallow, Y-cross, Y-sail, Y-stick, and the others, along with his ingenious practice methods, delivered football forever from its more ancient roots. The spread to run offense of Urban Meyer and Rich Rodriguez may ultimately prove more viral and sustained than the pass-first Airraid. But Mumme's legacy is assured; as prophet, harbinger, and technician of the explosion of the passing game throughout football, particularly at the lower levels. In his way, Hal Mumme might prove to be the most influential coach of the last two decades. I wouldn't bet against it: Hal always likes his odds. Lots of interesting stuff from Sunday's NY Times article on the Ravens and Ozzie Newsome's approach to the draft. But maybe most interesting is this approach to identifying organizational talent -- guys within the organization who are smart, hardworking, and are willing to eat, breathe, and sleep football. All organizations and businesses look for this kind of person, but Ozzie Newsome has an interesting technique, though unsurprisingly he learned it from Bill Belichick. In a program Newsome borrowed from Belichick, the Ravens rarely hire a scout from outside the organization. Rather, Newsome has his 20-20 club. He pays 20-somethings who hope to rise through the personnel department $20,000 a year. They work 20 hours a day filing tapes, picking up free agents at the airport and cleaning out the refrigerators of released players who have abandoned their apartments. 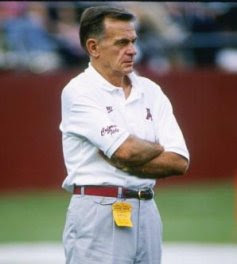 In 1996, Coach Ted Marchibroda used to give DeCosta $100 and ask him to get an oil change for his car and keep the change. DeCosta dutifully scouted out the places that would do an oil change for $9. In the meantime, Newsome and his staff get a read on an up-and-comer’s work ethic and intelligence. The older scouts tutor the younger ones in what to look for, so everybody’s eye is trained the same way. I will have more to say about the NFL draft in this next week, but it's worth pointing out that this is yet another area in football where you can only deal in probabilities, can only do your best and hope the dice roll works in your favor. 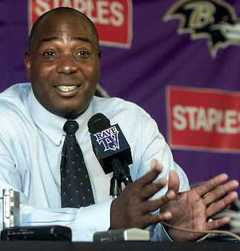 Newsome’s first draft as the director of player personnel in 1996 may define his career. Convinced the Ravens could support a troubled player, Newsome was prepared to take running back Lawrence Phillips because the Ravens needed a rusher. But offensive tackle Jonathan Ogden fell into the Ravens’ lap at No. 4. Ogden was rated higher on the Ravens’ draft board, so they took him. Phillips, eventually taken sixth, washed out of the league after playing only 35 games. Ogden is a near lock to join Newsome in the Hall of Fame. The Ravens got Ray Lewis later in the first round, too. As he prepares for next weekend’s draft with his reputation burnished, Newsome can afford to laugh at his early good fortune. “I might not be here if it had gone the other way,” he said. The story that has dominated the past week: Greg Paulus, former Duke point guard, is plotting a return to football. He worked out with the Green Bay Packers, and, for a brief moment, the buzz was that the University of Michigan offered him a scholarship. The Michigan angle is now dead, he's not going there. Apparently Paulus was a sought-after recruit coming out of high school -- Tom Lemming ranked him the #1 QB in his class. So all these shenanigans aren't completely out of the blue. The blogosphere has gone bananas over this story, but what is Paulus doing? Let's take a step back. Paulus, who has spent the past four years at Duke playing basketball, is in many ways simply another graduating senior in this crazy economy who doesn't know what he's doing next year. (His bio lists his major as "[P]olitical science with a certificate in markets and management studies." I'm guessing "markets and management studies" isn't quite as marketable this year as it has been previously.) It's pretty obvious after his senior-season demotion to the bench that the NBA is not in his future; I don't know what his options are regarding playing basketball in Europe, which actually pays quite well. So he's exploring this football thing. The reports could be misleading, but it appears that the Packers approached him. And for some college, I don't really see the downside with letting the kid at least walk-on. You might as well bring in a guy who has some innate talent and let him prove himself. (Most all D-1 walk-ons tend to be "preferred walk-ons" who get recruited by the coaches -- walk-ons are very rarely of the "Rudy" cariety), And all the talk by some Michigan fans that it would somehow scare off their other QBs seems bizarre to me. But I guess that's moot now. Now this assumes someone wants him. David Cutcliffe, Duke's head football coach, said no way to Paulus as a QB. Yet, again, I don't see the downside with letting him walk on, and many teams have an open scholarship spot or two because of players let go for disciplinary reasons; unless you desperately need it why not? Part of this deal is, as I said, Paulus is yet another college senior heading into a crazy job market with uncertain employment options. In five years, even if he made the NFL or NBA, he might still be out of work and then what? So another year getting some more job skills, on top of his Duke degree, is a good idea. So maybe if Paulus can't be the next Tom Brady, maybe he can be the next Kurt Warner? And if that doesn't work out, maybe he'll have a good fallback plan. Also, check out the MarkUp Blog, where the various features of the site are displayed on some captivating and at times hilarious little league football highlights (gotta love the freeze play where all the kids stand there to confuse the defense while one guy goes deep). Came across this video by Steve Logan (East Carolina HC, Boston College OC) discussing the route. (Logan is underrated as a passing/offensive guy.) It's a nice supplement to my recent article on the concept with Dan Gonzalez. Logan is focused on "hot reads" and defeating blitzes. Good video, though shoot me if I ever use the phrase "we want to be very offensive." Average yards per attempt is the most important stat for measuring efficiency. But what about median numbers? You’ve probably never thought about this before, but how many yards do you think the average QB gets on his median pass attempt? The answer is zero, and for most of NFL history, it was less than that. 2008 was the greatest passing season of all time (by adjusted net yards per attempt), but even this past season, the median pass attempt probably went for only one or two yards. The average completion percentage was 61% while the sack rate was 5.9%; this means that on every 1,000 dropbacks, 59 times the QB was sacked. On the remaining pass plays, 574 times (61% of 941) of the time the QB completed a pass. So only 57.4% of all pass plays were completed, and surely a bunch of those completions went for negative yards or no gain. In 1998, the completion percentage was 56.6% and the sack rate was 7.2%; this means only 4.8% of all completions would need to go for no gain (or worse) to make the median pass attempt be zero (or negative). In ‘88, the numbers were 54.3% and 6.8%; only 1.2% of completions would need to go for no gain (or worse) to make the median pass attempt be zero (or negative). In ‘78? A leaguewide completion percentage of 53.1% coupled with a sack rate of 7.9% meant that 51% of all pass plays did not gain yardage even ignoring all completed passes for negative or zero yards. Passing is high risk, high reward. The large gains offset the risk, which is why teams average more yards per pass than yards per rush. For the passers, frequency of success isn’t nearly as important as quality of the success. What about rushing? Just the opposite. In modern times, most RBs have a median carry length of three yards. I suspect that’s been the case for the majority of RBs for a long time. LenDale White and his 3.9 YPC last season? Median rush of 3 yards. Adrian Peterson and his 4.8 YPC? Median rush of 3 yards. Found some old notes from Bill Walsh on the drop-back pass. Oldie but a goodie. -Takes advantage of a bad defensive adjustment. - Adjust splits to break in or out. - Don't lead receiver - throw at his hip. - Throw outs to LEFT and ins to the RIGHT (from all drops). - When throwing to the right, step towards the receiver on the 3rd step. - 3 quick steps when throwing out. (WR 8 yrd split). - Best place to throw quick out is from SLOT formation. (to SE). - 3 big steps when throwing hitch. Throw to middle of the receiver. When receiver catches the ball, he pivots to the sideline and runs to goalline. (WR 12 yrd split). - Slant pass is a big chunk play. - 12 yrd split - 5 to 7 steps and break. - Slant is best weak. - Throwing strongside you should use dropback and weak flow. - Throw ball to middle of receiver and above his waist - if anything slow him up to catch it. - Receiver should always be aware of relationship between corner and safety. - Hop inside and come under control in hole. - Ball should be caught 1 ft. in front of receivers numbers. - Vs corner inside - go full speed and break across his face. - Always practice 1/2 as many throws to outlet as primary. - Ball control, timed passes; good on 1st and 10, 2 and 6, 3 and 4. - Receivers run 10 - 12 yrd routes. - WR 8 yd split. - Square out = 5 quick steps - don't lead WR. - 9 out of 10 square outs are thrown to the LEFT. - Throw square out into short field and away from rotation. - Prefer to throw square in to the RIGHT. -5 Steps and hitch step. -WR sells GO pattern. Inside release, outside push, plant outside foot and start in. -WR catches ball and runs straight upfield. -"Square-in, wide Flare, wall off." - Prefer Big, smooth WR. 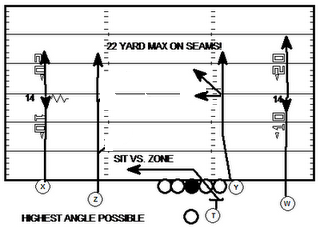 - WR 12 yd split. - QB 5 BIG steps and Hitch. - WR break into hole in the zone. 6. Curl: -5 step timed. -Throw to middle of WR. -GREAT vs middle LBer defender - if WR is not open go to outlet immediately. 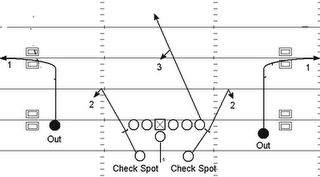 (C) Seven-Step Drop -Bread and Butter BIG chunk offense. 7. Go pattern: -- Only to fastest WR. -Practice 4 to 1 to fastest WR over other WR's. -Throw GO in conjunction with plat action. -Keep the length of the throw consistent. -7 step hitch and throw. -Practice throwing to a spot with WR standing there. -Don't throw if DB is deeper than WR when you hitch step. -Measure distance with WR full speed than practice stationary. -WR: release inside than out - chase DB step on his toes and run by him - keep DB in his backpeddle - look DB in the eyes NOT past him. -At 8 yds, be 1 yd inside, next 8 yds be 1 yd outside. -When thrown inside the 25 yd line change to 5 step drop. -Throw GO RIGHT more often than left. -Vs Cloud throw in hole (only vs stationary DB) 5 Step drop. -Only when DB is turing and running away. -20 yds full speed - plant and come back. -7 step and hitch step and throw to spot. -Ball should be released as WR is planting foot. -WR always keep elbows and arms in running position. Just before you break, drop head and dig (pump hands). Briefly, notes from Crowton (I think back from his Louisiana State days) on what he tells his quarterback's to look for before the snap. one safety, or no safeties? (2) Check the perimeter and the edges of the box. How will I be protected? Another common method (popular with the Airraid types) is to integrate the number of safeties into the snap count. I.e. "Go! 2! 2! Set, Hut!" This way the QB has to look. You just put your vision out there, and you'll get the readers you deserve. Thanks to all the readers (and especially commenters); Smart Football's hits have been steadily rising so someone out there is reading. As another bit of blog news: I finally bought "smartfootball.com." The rights haven't been all transferred so the address doesn't work yet, but I'm almost there. Surrency dropped out of high school in the ninth grade, he said, to support his family. He served jail time, 90 days, after being charged with various crimes, some felonies. He decided to make something of himself. Earned his diploma. Began playing football. Wound up at a California community college, then at Florida State. Before enrolling at Florida State and before enrolling in El Camino Community College, where Surrency played for two seasons, he played with the Florida Kings, a South Florida "minor league" football team that has helped athletes with troubled pasts to earn opportunities to play in college. A little-known NCAA rule has jeopardized his future. The rule is No. 14.2.3.5 in the NCAA Division I Manuel. It is titled, "Participation After 21st Birthday," and it mandates the following: If an individual participates in an organized sport after his 21st birthday, but before enrolling in college, that participation "shall count as one year of varsity competition in that sport." Surrency played with the [minor league] Kings after he had turned 21. Had he not, he might never have had the chance to go to college. Regardless, though, his time with the Kings has cost him his final year of eligibility — at least for now. Florida State is appealing on Surrency's behalf. 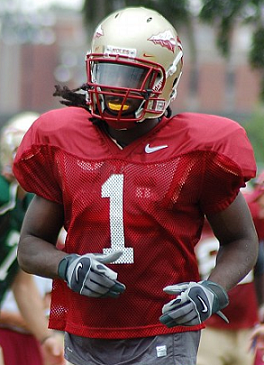 If FSU loses the appeal, Surrency's college football career would be over. It's likely, too, that his pursuit of earning a degree in criminal justice — Surrency would become the first member of his family to earn a college degree — would also be over. Sad stuff. Dr Saturday rightfully rails against this rule as "tone-deaf bureaucracy par excellence, and I have little to add to that. But I was curious: does Surrency have a chance on his appeal? Unfortunately, my tentative answer is no. I don't have all the resources and I'm no NCAA expert, but Surrency is behind the eight ball having already been ruled ineligible, and things from here look bleak. His best shot is on his appeal before the NCAA, being fought for him by Florida State. I tried in vain to locate all the standards for NCAA eligibility appeals, but it looks to me they don't have the power to just cast aside a rule that should otherwise apply. In that case the only way around the rule is for the NCAA, through its rulemaking body, to remove it. But in that case it wouldn't even be clear that the removal could work retroactively in Surrency's favor. The upshot is that unless the NCAA appeals body decides to (and has the power to) act charitably in direct defiance of the rules, Surrency will probably lose. So what does that leave? 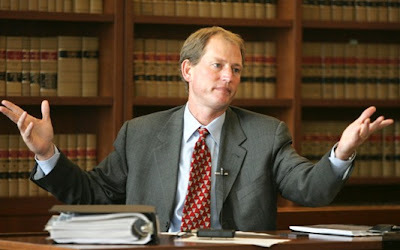 Litigation. But litigation on these eligibility questions rarely goes well for the would-be student-athlete. There's not much of a hook to hang it on: you have to find a source of law that allows you to overturn what some NCAA body does -- or, more precisely, tells the University to do: the NCAA doesn't have the power to fire employees or take students off the football teams, they just threaten the University with fines and sanctions if they don't comply. This is relevant when it comes to litigation because, while the University typically supports the student during the appeal to the NCAA, after that the school tells the kid to get lost lest it lose money, wins, or scholarships, so the student often winds up suing both the NCAA and their school that had formerly supported them. Anyway, there is no constitutionally protected property right to participate in college sports, and further undermining any suits against the NCAA grounded in the constitution is that the Supreme Court has ruled that NCAA is not a "state actor." (Set in stone in the famous NCAA v. Tarkanian case involving former UNLV basketball coach Jerry Tarkanian.) This is important because only governments and related "state actors" can violate people's constitutional rights; private parties aren't restricted by the various amendments, something many people -- including plenty of public officials -- don't realize. But that means that just about all of Surrency's eggs are in this NCAA appeal, and it appears that the rule was properly applied to Corey; it's just that the rule itself is stupid. Good luck to Surrency and FSU, and I'll leave him with the last word. Surrency said this experience has worn on him. He is beginning to question his love of football. He said, "It's killing me, man. I'm losing my fight for the game right now." Sid Gillman, along with Paul Brown, basically invented modern football. 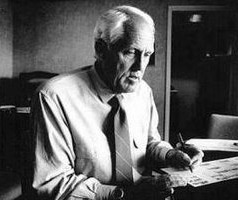 Bill Walsh left his stamp, but he was largely just making systematic what those two had already created. Brown, an approach to football itself -- gameplanning, huddling, drawing up plays (the modern convention of Xs and Os and diagrams looking how they do can basically be attributed to him). Anyway, here are some notes from Gillman on passing offense, courtesy of Coach Bill Mountjoy. 1. The timing of the delivery is essential. It is the single most important item to successful passing. 2. Each route has its own distinct timing. As routes and patterns are developed on the field, the exact point of delivery will be emphasized. 3. Take mental notes on the field on timing of the throw. 4. If you cannot co-ordinate eye and arm to get the ball at it’s intended spot properly and on time, you are not a passer. 5. Keeping the ball in both hands and chest high is part of the answer. 6. Generally speaking, the proper timing of any pass is putting the ball in the air before, or as the receiver goes into his final break. 7. If you wait until the receiver is well into his final move, you are too late. 1. You must know the theory of all coverages. Without this knowledge, you are dead. 2. You are either attacking man for man, or zone defense. 3. Vs. Man for Man Defense, you are beating the Man. Vs. Zone Defense, you are attacking an Area. 4. Not knowing the difference will result in stupid interceptions. 5. Study your coverage sheets so that by merely glancing at a defense you know the total coverage design. a. Hit the single coverage man. This will keep you in business for a long time. b. Stay away from receivers who are doubled short and long. c. Do not throw to post if weak safety is free unless you are controlling him with another receiver, and even then it can be dangerous. d. Flare action is designed to hold backers. If backers are loose, HIT flare man. e. The secret to attacking Man for Man is to attack the single coverage man who is on his own with no help short or to either side. f. You must know the individual weaknesses of our opponents and attack them. g. There are many methods of dropping off by deep secondary men. Each method provides a weakness – know them. a. To successfully attack zone defense, concentrate on attacking the slots (X-Z Curl, Y Curl, Cross Routes). b. Flare action is a must to hold the backers close to the line to help open up the zones behind them. 8. Exact knowledge of defensive coverage and the patterns to take advantage of these is a must. 3. One-Back formations are a must. 1. Blue-Gray Sky breaks down the "devolution" of Charlie Weis's Notre Dame offense. 2. Rocky Top Talk analyzes zone running. Pretty good breakdown, and on the whole very informative. A few minor points though. First, the article seems to confuse the outside-zone and the inside-zone (it professes to talk about the "inside zone" but then talks about the "stretch sweep"); the two are different plays, with the "stretch" being the same as the outside zone and the inside zone going by a lot of names, from "belly" to just "zone." Second, the article discusses the need to cutback the run but, based on the above diagram, the blocking is drawn up against the 3-4 defense, and the offense has a numbers advantage to the tight-end side. So I would want the runner to keep it to that side; otherwise he'd be possibly cutting back into a pursuing unblocked defender. 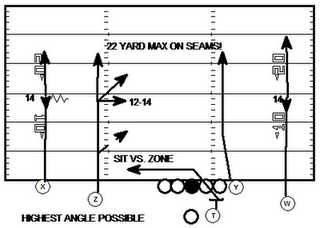 Finally, the article mentions that zone blocking wants nimble, quick, smaller lineman. This is true sometimes, but other times not so: the Dallas Cowboys in the 1990s with Emmitt Smith used zone blocking almost exclusively and had the largest offensive linemen in the NFL. But that is a matter of taste. Anyway, all these are minor points. Check it out. I'm working on a post about sort of "advanced zone-read" stuff, considering all the games defenses now play and the offense's responses, but for now this stuff can be your teaser. 4. Get the Picture on the BCS anti-trust morass and grandstanding. Archie Cooley, Jerry Rice, and the "Satellite Express"
Cooley, 45, is head coach at Mississippi Valley State University, a little school with an enormous passing attack. In the last two years, his Delta Devils - assembled with a recruiting budget of $3,500 a year - won 17 of 21 games, averaging 51 points a game. They did it with no huddle. They did it with 55 passes a game. They did it with something called the Satellite Express, an imaginative, freaky offense designed by Cooley and named presumably for quarterback Willie "The Satellite" Totten, a senior who has replaced Neil Lomax as the most devastating college football passer ever. Using Cooley's Satellite Express, Mississippi Valley State has broken virtually every NCAA Division I-AA passing record. Willie "The Satellite" Totten was the triggerman, but on the receiving end of his passes, roughly 300 of them, was Jerry Rice. Yeah, 49ers-Hall-of-Fame-Dancing-with-the-Stars Jerry Rice. And Rice's incredible talent led Cooley to the most natural evolution of his five-wide attack: put four guys to one side of the field, and put Jerry Rice -- nicknamed "World" because there "wasn't a pass in the world he couldn't catch" -- to the other. Totten would signal a route to Rice backside (much like the run and shoot "choice" concept) and then the four receivers to the other side would run some dizzying array of combinations, usually with at least one guy in a sort of "trail" position who could catch a dump-off if the defense retreated. By doing this Cooley was able to put the defense in an impossible bind: no one in D I-AA could cover Rice (in his college career he set then NCAA records in catches, with 301, yards, with 4,693, and touchdowns, with 50), but if the defense double- or triple-teamed him then they gave up numbers and leverage to the four receiver side. As you can imagine, footage of Mississippi Valley State is, well, scarce. So I was delighted to stumble on this old gamefilm (apparently filmed on some kind of pre-Victorian camera). In the clip, notice how many guys Louisiana Tech lines up on Rice: always two, sometimes even three. But if you wait until near the end of the clip, around the 4:30 mark, the defense finally singles him up. 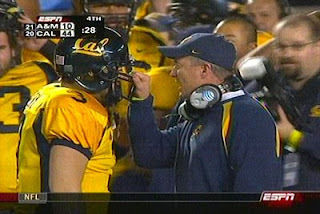 Totten then calls Rice's number and throws him a fade for an inevitable touchdown. Time for the defense to rethink things. Update: Happy April Fools' Day . . . .
Well, it's official. Apparently in early discussions and camps Schwartz and his staff have begun working with players and they have chosen a bold new (old?) direction to get the Lions' lifeless offense back on track: the run & shoot. We have to do something bold this year, and I've always thought the run and shoot was one of the hardest offenses to defend. We might mix it up with some five wide receiver stuff, but we're going to base out of four wide receivers and one running back and run the majority of those old concepts. I've met with Mouse Davis and June Jones and even Mike Leach in the past few months, and we've seen what they've done and sort of fit it together with what me and Coach [Scott] Linehan want to do. Now, readers of this site know I have no problem with this sort of thinking, but I can say I'm shocked that Schwartz and the coaches would even consider making it public. I mean these are just leaks at this point from early camps, but come fall camp and 24/7 ESPN scrutiny, we'll be back to hearing all the old stuff about the Houston Oilers losing the comeback game to the Bills and how the 'shoot can't get it done in big games, etc. Looking for fresh coaching talent, Schwartz analyzed the offensive and defensive statistics of what he called the "midlevel schools" in search of any that had enjoyed success out of proportion to their stature. On offense, Texas Tech's numbers leapt out as positively freakish: a midlevel school, playing against the toughest football schools in the country, with the nation's highest scoring offense. Mike Leach had become the Texas Tech head coach before the 2000 season, and from that moment its quarterbacks were transformed into superstars. In Leach's first three seasons, he played a quarterback, Kliff Kingsbury, who wound up passing for more yards than all but three quarterbacks in the history of major college football. When Kingsbury graduated (he is now with the New York Jets), he was replaced by a fifth-year senior named B.J. 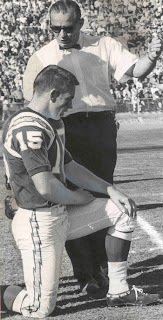 Symons, who threw 52 touchdown passes and set a single-season college record for passing yards (5,833). The next year, Symons graduated and was succeeded by another senior - like Symons, a fifth-year senior, meaning he had sat out a season. The new quarterback, who had seldom played at Tech before then, was Sonny Cumbie, and Cumbie's 4,742 passing yards in 2004 was the sixth-best year in N.C.A.A. history. Now Texas Tech had Cody Hodges, still another fifth-year senior - barely six feet tall, with an average arm and four college seasons on the bench. Before the 2005 football season even began, Hodges was short-listed for the Maxwell Award for the finest college football player in the land. Whoever played quarterback for the Texas Tech Red Raiders was sure to create so much offense that he couldn't be ignored. Schwartz had an N.F.L. coach's perspective on talent, and from his point of view, the players Leach was using to rack up points and yards were no talent at all. None of them had been identified by N.F.L. scouts or even college recruiters as first-rate material. Coming out of high school, most of them had only one or two offers from midrange schools. Sonny Cumbie hadn't even been offered a scholarship; he was just invited to show up for football practice at Texas Tech. Either the market for quarterbacks was screwy - that is, the schools with the recruiting edge, and N.F.L. scouts, were missing big talent - or (much more likely, in Schwartz's view) Leach was finding new and better ways to extract value from his players. "They weren't scoring all these touchdowns because they had the best players," Schwartz told me recently. "They were doing it because they were smarter. Leach had found a way to make it work." I guess this is what appealed to Schwartz: doing it smarter; doing more with less; and doing something different. All three are things Schwartz will have to do in Detroit. And if you can't get Mike Leach (or don't know if you could handle the personality quirks involved with having him), then do the next best thing: hire a veteran offensive guy (Scott Linehan) but sit down to do something that is is smarter, a better equalizer, and different. The run and shoot certainly gives you all that. Now, it's true that the NFL is more spread than it was then, but the run and shoot is still different: it's based on every receiver reading the coverage and reacting on the fly -- it strives to make the defense wrong on every play. Moreover, from a personnel standpoint, the Lions have some receivers, but they struggle at runningback. The line problems can be ameliorated by creative use of screens and quick passes. The biggest obstacle is quarterback, but that would be an issue with every system in the NFL. There's a good chance the 'shoot can, well, do more with less. What they do need to find is a guy who can make good decisions but doesn't necessarily have to be Tom Brady or Peyton Manning otherwise. Let Calvin Johnson run the "choice" backside and try to outnumber the defense to the frontside, and for god's sake just get them the ball in space. 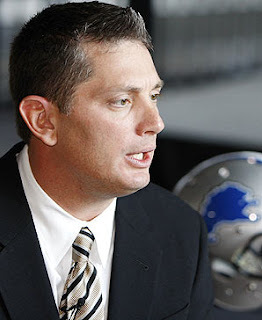 Now, it can't be lost on Schwartz that the 'shoot was once the offense of choice in Detroit. But he also has to know that, since it has been gone, Detroit hasn't exactly succeeded. They put up better numbers and won more games with that offense than they ever have with the "traditional" stuff that Matt Millen imposed. So why not? Finally, no doubt Schwartz is aware of what went on in Miami last year: the Dolphins came out with creativity -- the Wildcat of course -- but Chad Pennington also threw for over 3,000 yards to help that offense get back on track. Schwartz is clearly hoping that it will work. Linehan failed in St. Louis but is a respected mind who has been around spread offenses all his career (particularly at Louisville), and even tight-ends coach Tim Lappano was an old 'shooter before he got with Joe Tiller at Wyoming and then Purdue. So they will know what they are doing. I'm looking forward to seeing the run and shoot back in the NFL.